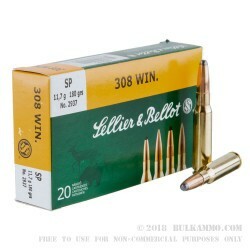 This 308 Win cartridge by Sellier & Bellot sports a 180 grain projectile, which is on the heavier side for bullet weights typically commercially available in its caliber. 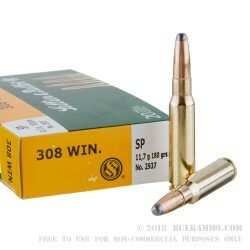 The soft point bullet is ideally suited for hunting at close to medium ranges, as its nose deforms to cause slower expansion and deeper penetration than a comparably heavy hollow point would. 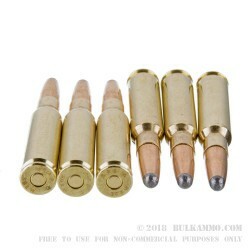 You will find that its bullet’s shape causes this round to load exceptionally in lever action rifles, although it will perform just as admirably in semi-automatic weapons including the AR-15. Based in Vlašim, Czech Republic and founded in 1828, Sellier & Bellot is not only an old ammunition manufacturer, but also one of the oldest companies in the world. The nearly two hundred years they have spent mastering their craft is evident throughout this quality cartridge, from its precisely engineered Boxer primed brass casing to its consistently performing bullet. 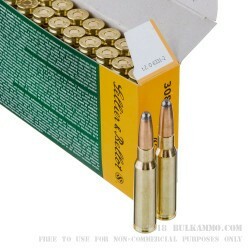 Your hunting trip’s success will not hinge on your ammo’s quality should you chamber this round in your rifle. Q: What is the drop at 300 meters?